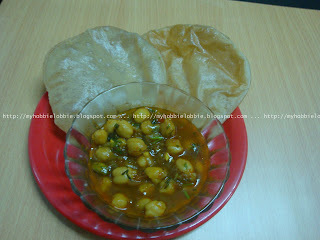 You've probably heard me mention the "poori" (pronounced poo-ree) in a couple of posts before, like here and here. Both these posts give you ideas of stir fries and curries that you can serve with pooris. They are fairly simple to make. I love these little fellows so much, that I can eat them plain, without anything else to go with it. I don't make them too often 'coz they're deep fried and trust me when I say you may not be able to stop at just a couple. They taste incredible when they are hot. If there are any leftovers, I refrigerate them and the next day I simply warm them on a griddle and they are good to go. Mix the flour and salt in a large mixing bowl. Make a well in the centre and adding water a little at a time, knead to form a nice pliable dough. If you need to use more than a cup of water, please do so. Heat the oil for deep frying over medium heat. To test the oil, drop a tiny pea sized ball of the dough carefully into the oil. It should sizzle and rise to the top fairly quickly. If this happens, your oil is at the right temperature. If it browns straightaway, your oil is too hot. Take it off the heat for a while and then start frying. If it just sinks to the bottom without any sizzle, your oil is not hot enough. Deep fry as you're rolling them out. Don't stack the raw discs before frying. When golden brown, drain on absorbent paper. Puris are an all-time favourite! We love them too Shirley! Thanks for stopping by! I have never had these little treats, but I can't wait to try your recipe. It looks like it would be so good. Hope you are having a great week end and thank you so much for sharing with Full Plate Thursday. These sound delicious! I have heard about pooris, but never actually tasted them. Thank you for sharing the recipe with Let's Do Brunch, so I can make them myself! Thank you April, I hope you enjoy them as much as we do!